Armadillidium vulgare, the pill-bug , pill woodlouse or potato bug, is a widespread European species of woodlouse. It is the most studied terrestrial isopod. Armadillidium vulgare are a grey-brown in color with an oval-shaped body. Potato bugs average length is 18mm. The body is divided into three main regions, the head, the pereion(thorax), and the pleon(abdomen). Potato bugs have five abdominal segments and seven exterior plates called "pereonites". They also have seven pairs of short legs and two pairs of antennae. They are known for their capability of rolling into a ball when disturbed. Armadillidium vulgare are crustaceans and are more closely related to crabs and shrimps than insects. Armadillidium vulgare are typically found under rocks in damp soil or under bark where they can burrow. They are mostly inactive during the day and are active at night. 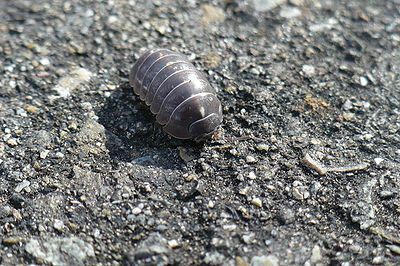 Potato bugs can be found in the forest, garden, or a basement. Armadillidium vulgare are omnivorous. They feed on fungi, live or dead plants and animals. Armadillidium vulgare is most commonly found in North America. Armadillidium vulgare reproduce on land. The eggs develop in a pouch filled with fluid where the young develop fully and are released. 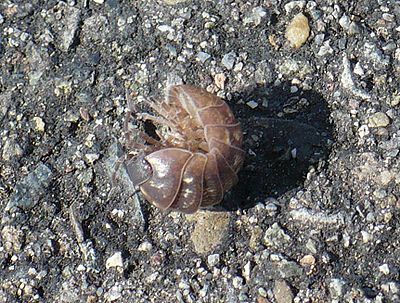 Potato bugs usually produce between one and two broods. 1. Brown, C. 1999. "Armadillidium vulgare" (On-line), Animal Diversity Web. Accessed May 10, 2010 at http://animaldiversity.ummz.umich.edu/site/accounts/information/Armadillidium_vulgare.html. 3. Warburg, M. 1993. Evolutionary Biology of Land Isopods. Springer-Verlag, NY. Pages 50-53, 69, 70-70, and 101. 5. 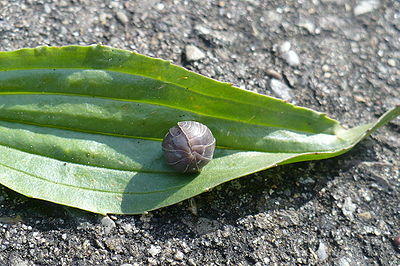 Sutton, S. L. (1972) Invertebrate types: woodlice. Ginn & Company Ltd., London. This page was last modified on 12 May 2010, at 15:22.